2 holiday accommodations located in / near Competa, Costa del Sol region of Spain in always sunny Andalucía. Finca el Regalo - a country villa on 20.000 m2 terrain, is a luxury accommodation with a private swimming pool (10 x 4.5m) for max. 6 persons + 1 small child. Enjoys spectacular views across the valley and south to the Mediterranean coast. 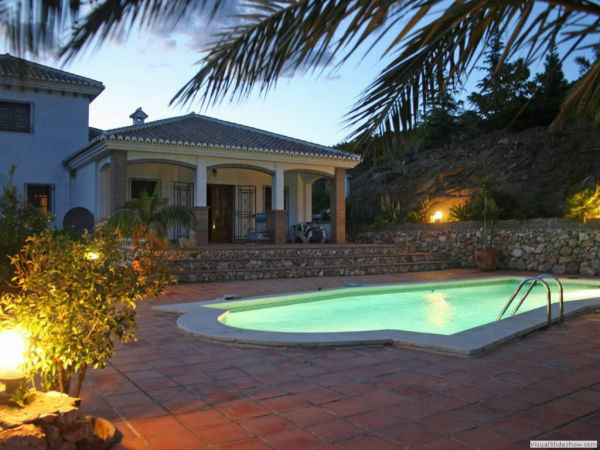 It is located in a rural/coastal area of Spain, 12 minutes drive from the village Competa. and 25 min drive from the coast..
Competa is situated 650m above sea level and due to its moderate and healthy climate a lot of people prefer this area. Being situated some distance from the sea enables Competa to enjoy a very fine climate during the winter months. Competa the old Moorish Town overlooking the Sierras is relatively free of tourism and still intrinsically Spanish in culture, bustling with local live. When you take a walk to Competa - which for centuries has been the capital of wine and resins - you will find yourself immediately immersed in all the charm of a village that, with it's narrow white-washed streets and flower-covered balconies, appears impervious to the passage of time. The village Competa is very well served with an abundance of fine restaurants and bars each offering local cuisine or tapas at low prices. Competa's inhabitants basically live from agriculture, especially wine growing, from which wines they obtain the "Moscatel wine" and "Uva Pasa" (Dry Grapes), both products internationally appreciates due to their excellent quality. Each year on 15th August Competa hosts a very famous wine festival called El Noche Del Vino (The Night of the Wine). At the end of July there is the annual Feria (country fair) which usually last a week when the local people hardly sleep at all. 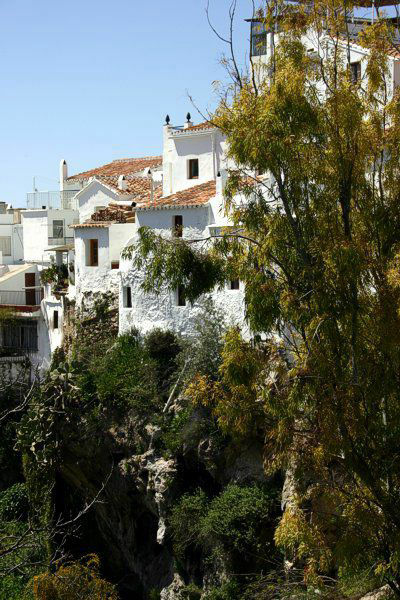 For anyone who wishes to explore the foothills of Sierra Almijara the countryside surrounding Competa offers splendid views, excellent walking, bird watching and horseback riding. It is a good starting-point for excursions and hikers. This Costa del Sol area is perfect both for walking in the mountains and relaxing on the beach. From December to April you can enjoy alpine ski sports in Sierra Nevada the Costa del Sol ski resort. There are many places to visit around Competa that offer a wide range of traditions, beauty, history and amusements. The Alcazaba in Málaga, with the port and the city itself and the Piccaso museum; Córdoba, with it's grand Mosque; Granada, with it's incomparable Palace of the Alhambra; or the beautiful gardens of Seville and, as a backdrop, the snowy peaks of Sierra Nevada - are just some of the examples. In Nerja you should visit the most spectacular attraction - fascinating caves, located just three kilometres from the centre of town. They include archaeological treasures such as paintings over 20,000 years old and other pre-historic remains. For the more adventurous, Madrid is only a 2 1/2-hour train drive (AVE) away and Morocco is just across the Straight of Gibraltar.